The second meet of the Third Round of Pakistan-India Legislators and Public Officials Dialogue on Sharing of Experiences on Governance and Democracy was held at the Centre for Research in Rural and Industrial Development (CRRID) in Chandigarh, India, on March 10, 2016 to share experiences and perceptions on Effective Agriculture Practices and Policies. The Dialogue brought together Members of Parliament and State/Provincial Legislatures from Pakistan and India, practitioners and subject-experts from the two countries who raised key issues and reform ideas covering the theme of promotion of agriculture. Participants acknowledged and appreciated the cooperation, facilitation and co-hosting of the Dialogue in Chandigarh by the Centre for Research in Rural and Industrial Development (CRRID) alongside PILDAT. Special thanks in this regard were also offered by the delegates for Mr. Mani Shankar Aiyar, MP, for facilitating this cooperation between CRRID and PILDAT and in his leadership and facilitation of the Dialogue. The dialogue participants on both sides agreed that in Agriculture, as in other areas, there is an enormous potential to learn from good practices and policies in both countries for each other. They demanded that barriers to communication and travel must be brought down in this regard. Participants from Pakistan noted with interest some of the key initiatives implemented in the Indian Punjab for promotion of improved agricultural practices. These included low-interest agricultural loans set at 8% interest with subvention of 4%; provision of duty free tractors to farmers and loans for tubewells; water conservation by imposing restriction on plantation of rice before June 10 each year and time-limits of 15-days for Government functionaries to take decisions on agricultural loans, etc., which resulted in thousands of loans for tubewells. Both sides acknowledged that agriculture remained a major area of potential cooperation for both India and Pakistan. Most challenges faced by the agricultural sectors in both the countries are similar. These included groundwater depletion; deteriorating quality of groundwater and soil degradation and air pollution due to excessive use of insecticides and pesticides; stagnation in cropping yields and last, but not the least, adverse impacts of climate change. It was also recognized that apart from these challenges, there is a critical need to improve the marketing of farming products. Participants stressed that Governments may consider cooperating to address these challenges to avoid the threat of food security, high number of suicides of farmers with low-holdings and an adverse impact on the economy. Apart from these shared challenges, there are also challenges peculiar to each country. For Pakistan, these include low per acre yield; inefficient use of irrigation water; infrastructural deficiencies; deficient agricultural research; high input costs; absentee farmers; lack of robust and consistent price supporting mechanisms; and low crop intensity. Some of the challenges peculiar to the Indian agricultural sector include lack of focus on horticulture, floriculture and livestock and subsidiary occupations like bee keeping, sericulture and pisciculture. It was recognized that both the countries have various areas for cooperation in the field of agriculture. These included sharing of research and development such as in seed quality; optimum irrigation practices; facing climate change; efficient agro-processing; recharging of groundwater; development of drought resistant crops; exploration of the horticulture, floriculture, livestock, fisheries, and organic farming sectors; use of technology and progressive agricultural practices. Participants proposed that there is a need to create a single market for agricultural produce, especially for perishable goods, to balance shortages and surpluses in both the countries. It was proposed that Joint Research Centres should be established on the India-Pakistan border, spanning over 100 acres on each side to begin with, where researchers and students of agriculture universities and experts can carry out joint research on seeds, crops, and combating crop-related diseases. Participants from India, highlighting their experiences, shared that free electricity for farmers, or even electricity at flat rates, is, in the long run, harmful for the agriculture sector. Pakistan may consider keeping this in view in case it wishes to subsidise the electricity for the farmers, which the Indian scientists believe has been responsible for fast lowering water table in Indian Punjab. Participants also believed that there is a need to promote regular exchanges between students and experts on agriculture, so that the practitioners on both sides remain apprised of good practices. The visa policy where India-Pakistan citizens over 65 years of age were granted visa at the border should be implemented in letter and spirit. To consider promoting exchange of farmers’ delegation and facilitate participation of industrialists and farmers in agriculture fairs (Kissan Melas) on both sides of the border. The small farmers and the landless peasants’ problems cannot be solved in the farm sector alone. They need to be provided with off-farm gainful employment opportunities to supplement their income. In addition, participants also underscored an urgent need across the SAARC countries to strengthen the third tier of democracy, i.e., Elected Local Governments. Both sides agreed that both India and Pakistan must share good practices in this regard, adding, at a later stage, lessons and experiences from other SAARC countries. Both PILDAT and CRRID agreed to cooperate further in this regard. The Pakistani Delegation, joining the Dialogue in Chandigarh, included (in alphabetical order by first Name in the sequence of Members of Senate, National Assembly, Provincial Assemblies and Experts) Senator Lt. Gen. (Retd.) 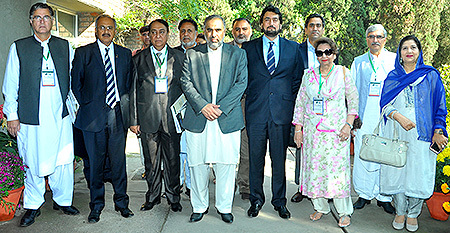 Abdul Qayyum, (Punjab; Pakistan Muslim League — Nawaz – PML-N); Senator Nauman Wazir Khattak, (KP; Pakistan Tehreek-e-Insaf – PTI); Senator Saud Majeed, (Punjab, PML-N); Mr. Muhammad Afzal Khan, MNA, (NA-82 Faisalabad-VIII, Punjab, PML-N); Parliamentary Secretary for Finance; Mr. Shehryar Afridi, MNA, (NA-14, Kohat, KP, PTI), Mr. Asad Qaisar, MPA, (PK-35 Swabi-V, Khyber Pakhtunkhwa, PTI) Speaker Provincial Assembly of Khyber Pakhtunkhwa; Ms. Mahtab Akbar Rashdi, MPA, (RSW-156, Sindh, Pakistan Muslim League -Functional -PML-F); Mian Mehmood-ur- Rashid, MPA, (PP-151 (Lahore-XV), Punjab, PTI), Leader of Opposition, Provincial Assembly of the Punjab; Dr. Najma Afzal Khan, MPA, (RSW-320, Punjab, PML-N); Mr. Muhammad Ali Nekokara, Former SSP, Pakistan Police and Dr. Muhammad Shoaib Suddle, Former IG Police, Sindh & Balochistan, Pakistan. With Dr. Rashpal Malhotra, Executive Vice Chairman-CRRID, in the chair, the Indian participants joining the Dialogue included (in alphabetical order by first Name in the sequence of Members of the Lok Sabha and Subject Experts) Mr. Prem Singh Chandumajra, MP, Lok Sabha, Shiromani Akali Dal (SAD), Anandpur Sahib, Punjab; Dr. Kuldip Kaur Director General-CRRID; Dr. G.S. Kalkat, Chairman of Punjab Farmers Commission; Dr. Jaswinder Singh Brar, Professor of Economics, Centre for Economic Change, Punjabi University, Patiala; Ambassador (Retd.) P.S. Sahai, Principal Research Advisor-CRRID; Dr. R. S. Ghuman, Nehru SAIL Chair Professor-CRRID; Dr. S. K. Mangal, Member, Governing Body-CRRID; Dr. S. S. Johl, Chancellor, Central University of Punjab, Patiala; Sardar Manpreet Singh Badal, Former Finance Minister of Punjab; Dr. Satish Verma, RBI Chair Professor-CRRID; Mr. Satish Dhanda, Industrialist from Ludhiana; Dr. Sucha Singh Gill, Senior Professor-CRRID and Dr. Sukhwinder Singh, Professor of Economics, Centre for Economic Change, Punjabi University, Patiala.